The avocado (Persea americana) is a tree native tae Central Mexico, clessifee'd in the flouerin plant faimily Lauraceae alang wi cinnamon, camphor an bay laurel. 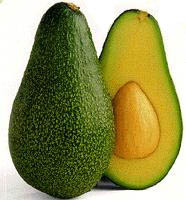 Avocado or alligator peir an aa refers tae the fruit (botanically a lairge berry that contains a single seed) o the tree. Avocados are commercially valuable an are cultivatit in tropical an Mediterranean climates throughoot the warld. Thay hae a green-skinned, fleshy body that mey be peir-shaped, egg-shaped, or spherical. Commercially, it ripens efter harvestin. Trees are partially self-pollinatin an eften are propagatit throu graftin tae maintain a predictable quality an quantity o the fruit. The tree graws tae 20 m (66 ft), wi alternately arranged leaves 12 centimetres (4.7 in) – 25 centimetres (9.8 in) lang. The flouers are inconspicuous, greenish-yellae, 5 millimetres (0.2 in) – 10 millimetres (0.4 in) wide. The peir-shaped fruit is 7 centimetres (2.8 in) – 20 centimetres (7.9 in) lang, wechts atween 100 grams (3.5 oz) – 1,000 grams (35 oz), an haes a lairge central seed, 5 centimetres (2.0 in) – 6.4 centimetres (2.5 in) lang. The subtropical species needs a climate withoot frost an wi little wind. Heich winds reduce the humidity, dehydrate the flouers, an affect pollination. Whan even a mild frost occurs, prematur fruit drop mey occur, awtho the Hass cultivar can tolerate temperaturs doun tae −1 °C. The trees an aa need well-aeratit siles, ideally mair nor 1 m deep. Yield is reduced whan the irrigation watter is heichly saline. Thir sile an climate conditions are available anly in a few auries o the warld, pairteecularly in soothren Spain, Portugal, Morocco, Crete, the Levant, Sooth Africae, Colombie, Peru, pairts o central an northren Chile, Vietnam, Indonesia, pairts o soothren Indie, Sri Lanka, Australie, New Zealand, the Philippines, Malaysie, Central Americae, the Caribbean, Mexico, Californie, Arizona, Puerto Rico, New Mexico, Texas, Florida, Hawai'i, Ecuador an Rwanda. Ilk region haes different teeps o cultivars. The fruit o horticultural cultivars haes a mercatly heicher fat content than maist ither fruit, maistly monounsaturated fat, an as sic serves as an important staple in the diet o various groups whaur access tae ither fatty fuids (heich-fat meats an fish, dairy products, etc.) is limitit. A ripe avocado yields tae gentle pressur whan held in the palm o the haund an squeezed. The flesh is prone tae enzymatic brounin; it turns broun quickly efter exposur tae air. Tae prevent this, lime or lemon juice can be addit tae avocados efter thay are peeled. The fruit is nae sweet, but rich, an distinctly yet subtly flavored, an o smuith, awmaist creamy textur. It is uised in baith savory an sweet dishes, tho in mony kintras nae for baith. The avocado is verra popular in vegetarian cuisine, as substitute for meats in sandwiches an salads acause o its heich fat content. Generally, avocado is served raw, tho some cultivars, includin the common Hass, can be cuiked for a short time withoot acomin bitter. Caution shoud be uised whan cuikin wi untestit cultivars; the flesh o some avocados mey be rendered inedible bi heat. Prolonged cuikin induces this chemical reaction in aw cultivars. It is uised as the base for the Mexican dip kent as guacamole, as well as a spread on corn tortillas or toast, served wi spices. In the Philippines, Brazil, Indonesie, Vietnam, an soothren Indie (especially the coastal Kerala an Karnataka region), avocados are frequently uised for milkshakes an occasionally addit tae ice cream an ither desserts. In Brazil, Vietnam, the Philippines an Indonesie, a dessert drink is made wi sugar, milk or watter, an pureed avocado. Chocolate syrup is whiles addit. In Morocco, thare is a seemilar chilled avocado an milk drink, that is sweetened wi confectioner's sugar an hintit wi orange flouer watter. In Ethiopie, avocados are made intae juice bi mixin them wi succar an milk or watter, uisually served wi Vimto an a slice o leemon. It is an aa very common tae serve layered multiple fruit juices in a gless (locally cried spreece) made o avocados, mangoes, bananas, guavas an papayas. Avocados are an aa uised tae mak salads. Avocados in savory dishes, eften seen as exotic, are a relative novelty in Portuguese-speakin kintras, sic as Brazil, whaur the tradeetional preparation is mashed wi succar an lime, an eaten as a dessert or snack. This contrasts wi Spainyie-speakin kintras, sic as Mexico or Argentinae, whaur the opposite is true an sweet preparations are eften unheard o. In Australie an New Zealand, it is commonly served in sandwiches, sushi, on toast, or wi chicken. In Ghana, it is eften eaten alone in sliced breid as a sandwich. In Sri Lanka, well ripened flesh, thoroughly mashed wi succar an milk, or treacle (a syrup made frae the nectar o a parteecular palm flouer) wis ance a popular dessert. In Haiti it is eften consumed wi cassava or regular breid for breakfast. In Mexico an Central Americae, avocados are served mixed wi white rice, in soups, salads, or on the side o chicken an meat. In Peru, thay are consumed wi tequeños as mayonnaise, served as a side dish wi parrillas, uised in salads an sandwiches, or as a whole dish whan filled wi tuna, shrimp, or chicken. In Chile, it is uised as a puree wi chicken, hamburgers, an het dugs; an in slices for celery or lettuce salads. The Chilean version o Caesar salad contains lairge slices o matur avocado. In Kenyae an Nigerie, the avocado is eften eaten as a fruit, an is eaten alone, or mixed wi ether fruits in a fruit salad, or as pairt o a vegetable salad. In Iran, it is uised as a rejuvenatin facial cream. A puree o the fruit wis uised tae thicken an flavor the liqueur Advocaat in its oreeginal recipe, made bi the Dutch population o Suriname an Recife, wi the name derivin frae the same soorce. Avocado slices are frequently addit tae hamburgers, tortas, het dugs, an carne asada. Avocado can be combined wi eggs (in scrambled eggs, tortillas or omelettes), an is a key ingredient in Californie rolls an ither makizushi ("maki", or rolled sushi). In soothren Africae, Avocado Ritz is a common dish. In the Unitit Kinrick, the avocado acame widely available in the 1960s whan it wis introduced bi Sainsbury's unner the name 'avocado peir'. ↑ Chen, H.; Morrell, P. L.; Ashworth, V. E. T. M.; De La Cruz, M.; Clegg, M. T. (2008). "Tracing the Geographic Origins of Major Avocado Cultivars". Journal of Heredity. 100 (1): 56–65. doi:10.1093/jhered/esn068. PMID 18779226. ↑ California Avocado Society 1973–74 Yearbook 57: 70–71, What kind of fruit is the avocado? ↑ Bates, Robert P. (1970). "HEAT-INDUCED OFF-FLAVOR IN AVOCADO FLESH". Journal of Food Science. 35 (4): 478. doi:10.1111/j.1365-2621.1970.tb00962.x. ↑ Zeldes, Leah A. (2010-06-02). "Eat this! The 'Hass' avocado, black and green and creamy". Dining Chicago. Chicago's Restaurant & Entertainment Guide, Inc. Retrieved 2010-06-20. ↑ Delgado, Martin. "Sainsbury, M&S ... and the great ad-vocado war". Daily Mail. Wikimedia Commons haes media relatit tae Persea americana. Wikisource haes the text o the 1911 Encyclopædia Britannica airticle Avocado Pear. This page wis last eeditit on 7 Mairch 2019, at 23:33.